Everything I had heard about this 181,000 hectare national park seemed like an exaggeration until I experienced it for myself. Nothing could have prepared me for the saturation of my senses that first afternoon, as I approached the park from the south on my trusty BMW GS1150. The main range appears on the horizon like a mirage as you head in on the gravel roads through sweeping bends. Continuing towards the heart of the park, the roads rise and fall like a rollercoaster, dipping to the level of the ultramarine waters then rising to high windswept passes, where you have a few seconds to take in your breath in awe before leaning into the next mysterious corner, and dropping back to lake level. This landscape gives a new meaning to exhilarating motorcycle touring. Of course, it’s not a place to ride at great speed. 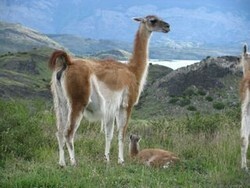 Firstly, it is a national park; and secondly, around the majority of bends you’re likely to come across some of the local wildlife: guanacos (wild members of the camelid family, closely related to llamas) grazing close to the road, and the ever-curious Patagonian fox. 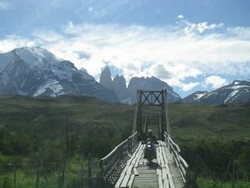 Just when you think you couldn’t be any happier on such a buzz of a ride, you are greeted by the best view of the park, as you near the main range from which the vertical pink granite Torres (towers) del Paine rise and, below them, the Cuernos (horns) del Paine, sprawling buttresses of lighter-coloured granite under strikingly darker caps of sedimentary rock. Luminous against this dramatic backdrop is one of the park’s many lakes, formed by melted ice from one of the four glaciers. The radiant light-blue colour is created by mineral particles suspended in the water. Bringing a new group of bikers to the park is always exciting, as I anticipate those sweeping bends on the superb winding road from which the true grandeur of the park can be viewed for the first time. Individuals react in different ways but the overriding response is one of awe and disbelief. The ride from Puerto Natales towards Torres is on excellent pavement for the first 30 kilometres then, as you head north-west, the road turns to firm packed gravel, which rolls over hills and along sweeping bends all the way into the park, making the ride a sheer delight. Inside the park, a series of roads and tracks traverse small wooden bridges up through the four different vegetation zones of this region: the Steppe, pre-Andean shrubland, Magellanic d eciduous forest and Andean desert. Anywhere in the park, it is always worth keeping an eye out for the local king of the skies, the majestic Andean condor. After riding several thousand kilometres to get there, many riders cannot resist the opportunity to get off their bikes and stretch their legs by taking a hike along some of the many trails throughout the park. But whatever way you choose to enjoy Torres del Paine, one thing is guaranteed: this UNESCO biosphere reserve with its outstanding scenery will stay in your memory long after your visit. This article was kindly provided by www.compassexpeditions.com.